It’s hard to believe it has been 11 years since the 9/11 attacks. Do you remember where you were that morning? I was in college and can remember being at the veterinarian’s office working. I will never forget it. I remember immediately calling my parents. Not that I could do anything but listen to the radio. Even though I was states away from the cruel attacks, I remember my stomach sinking. Was this really happening? My son is in the above picture at my parent’s house. 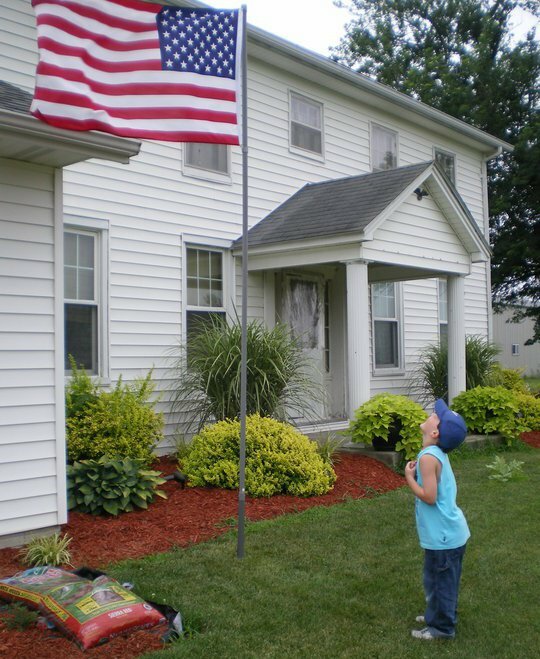 He is saying the Pledge of Allegiance to our flag. Yes, he has learned about the attacks. He loves to learn about history. It’s hard for him to understand what happened that day before he was even born. It’s hard for me to understand. My Mom and Aunts recently visited my sister who lives in Manhattan. They visited the 9/11 Memorial Museum of the World Trade Center in New York City. This is a video of one of the two Memorial Fountains. She said the fountains were massive. The waterfalls sit within the footprints of where the Twin Towers once stood. It also includes the name of each life lost in the 2001 and 1993 attacks. It is a great way we can show our respects to the lives lost. Learn more about the 9/11 Memorial. Please share your stories of 9/11. How many of you have visited the memorial site? Thank you to all the brave men and women who have fought or are fighting to protect our country. And we will never forget all the courageous people who lost their life on that day. I remember where I was when this horrible tragedy happened. I was in the car going down the road when it came on the radio. The first tower had got hit and everyone thought it was an accident, then the second tower, They then come on and said we were under attack. I felt so small, so vulnerable for the first time as an American. We go on in our daily lives not thinking about the others that hate us because we are Americans or what it really takes to keep us and our families safe. While we sleep at night someone else is out there risking their life to make it possible and that persons’ wife, husband,brother,sister,mother,father,son or daughter may be unable to sleep wondering if their brave loved one’s are safe for another day. All though I felt so vulnerable on that day that those monsters attacked out innocent I have never felt more close to my fellow man than I did during that time and I do feel like it has brought us all closer as a nation. I only wish it would not have took something so horrible and tragic to have made us have more love for one another. I will never forget what happened that day, I don’t want to forget…We need to remember for the victims, the families of the victims and the hero’s that worked so hard to save the one’s that could be saved as well as for this nation!! I remember the day so well. I was in my senior year of college and getting ready for class. My friend called and told me that a plane hit the Pentagon and the World Trade Center building. I turned on the tv just as the first tower fell. It was very unreal to me at the time. I echo your words, thank you to all our service men and women and my heart goes out to all the victim’s families. I was at work, when someone came out to the shop and said the first plane had hit i said no way thats got to be b.s. When they said the second plane hit I ran to the tv and watched in horror as thr rest unfolded. I was disappointed this year in how little there was on tv about it. I feel we should rewatch every detail every year so we dont forget and never let our guard down!! I was in England…..I was suppose to fly out 9/11 but I bumped up my flight 1 week….took me 2 months to make it back home-I’ll never leave the country again….I had just turn on the TV and I asked IS THIS FOR REAL…person in the room says-IT SAIYS IT”S LIVE….to which I replied BUT DO YOU SEE WHAT’S GOING ON?!?! I think a part of me is still numb to this day…..